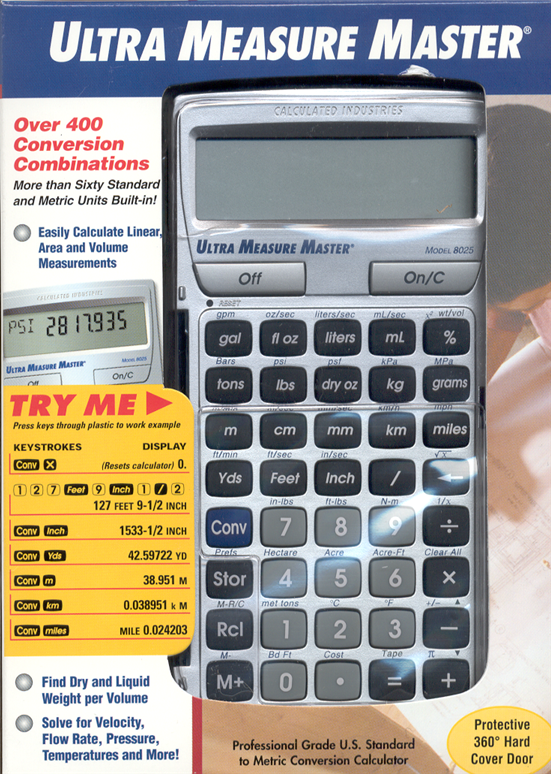 The Ultra Measure Master is the most complete and easy to use conversion calculator availabe for Engineers, Architects, Construction Pro's, Scientists, and Students. 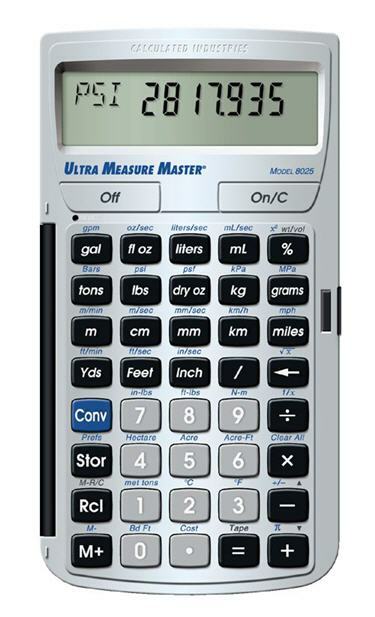 It has more than 400 conversion calculation combinations that allow you to convert measurements with the touch of a minimal number of buttons. Forget complex scientific calculations and formulas. This conversion calculator does it all to 12 digit internal accuracy. You won't need any other converter! Feet-Inch-Fractions or Yards, Miles, Decimal Feet/Inch Fractions, Millimeters, Centimeters, Meters and Kilometers. Convert kilometers (km) to miles and convert miles to kilometers. Convert centimeter to inches and convert inches to centimeters. 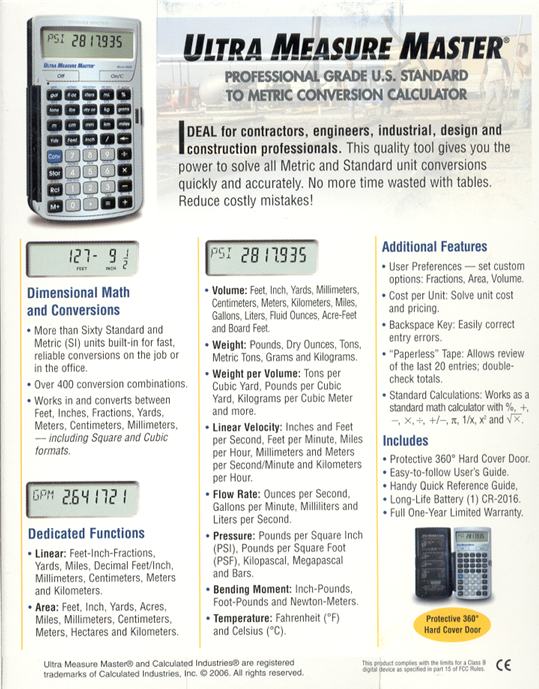 Distance calculator conversions. Metric converter for meter to foot conversion, centimeter to inch conversion, many more combinations. Fahrenheit (°F) and Centigrade (°C) temperature conversions. Feet-Inch-Fraction, Yards, Acres, Square-Miles, Millimeters, Centimeters and Meters, Hectares, Square-Kilometers. Cubic Feet, Inch, Yards, Acre-Feet, Board Feet, Millimeters, Centimeters, Meters, Kilometers, Miles, Gallons, Liters, and Fluid Ounces. Inches and Feet per Second, Feet per Minute, Miles per Hour, Minute and Hour, Millimeters and Meters per Second /Minute and Kilometers per Hour. Ounces per Second, Gallons per Minute, Milliliters and Liters per Second. Pounds per Square Inch (PSI), Pounds per Square Foot (PSF), kilo-Pascal, mega-Pascal and Bars. Tons per Cubic Yard, Pounds per Cubic Yard, and Kilograms per Cubic Meter. Inch-Pounds, Foot-Pounds and Newton Meters. Available only in continental USA.